This month we are featuring the crate exhibit designed for Koma Precision. The client wanted a display for their own exhibits that could be used in a variety of configurations and give them maximum flexibility for different exhibit venues. They were also interested in reducing the labor costs involved with exhibit installation and dismantling. We created a parallelogram-shaped display which allows the displays to be placed back-to-back in an island setting. Or, the walls can be opened straight for linear exhibit spaces. Since this display is free-standing, it can also be used when the company is participating in partner booths, where they do not have their own booth but rather are sharing space in another company’s booth. The company can pre-mount the product, and have the monitor with looping videos all set and ready to go. Just add some electricity. To help the client manage their overall trade-show budget, we used the crate design for their exhibit. With the crate design, the crate is actually part of the exhibit, although you don’t really see it. Using the crate booth helped the client drastically reduce the labor expenses they had with their previous displays. The client was able to budget a little more for the exhibit since far less of the budget was spent to set up and dismantle it at the exhibit venues. 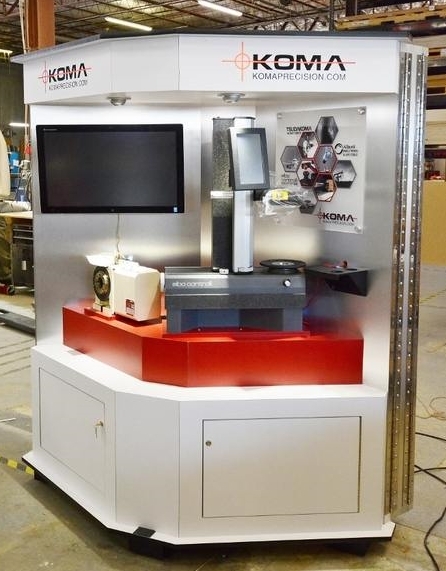 The crate design exhibit gave Koma Precision exactly what they wanted: a flexible display with multiple configurations, easy installation and dismantling, and cost savings in setting up and dismantling the exhibit. No matter what your exhibit challenges, give us a call. We create Exhibit Envy!